NASA is slated to get some help in the search for potentially hazardous asteroids, which is probably a positive thing considering the space-rock drama that unfolded earlier this month. On Feb. 15, a fireball exploded over the Russian city of Chelyabinsk, damaging thousands of buildings and wounding 1,200 people. 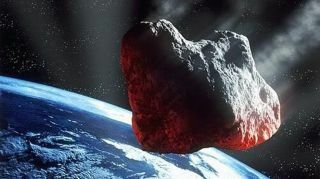 Hours later, the 130-foot-wide (40 meters) asteroid 2012 DA14 missed Earth by just 17,200 miles (27,700 kilometers), coming closer than the ring of geosynchronous satellites circling our planet. While astronomers had predicted 2012 DA14's close flyby, the Russian fireball caught them (and the residents of Chelyabinsk) completely off guard. The powerful explosion highlights the need for more intensive asteroid-detection efforts going forward, many researchers say. NASA-backed ground-based searches have spotted the vast majority of potentially dangerous near-Earth objects to date. But the B612 Foundation aims to join the hunt soon, and a pair of asteroid-mining firms hope their efforts also help keep our planet safe from marauding space rocks. Mapping out the orbits of near-Earth asteroids is a big job. Astronomers think 1 million or more such space rocks are out there, and just 9,700 have been identified to date. The good news is that NASA already has a handle on the biggest, most dangerous asteroids — the ones at least 0.6 miles (1 km) wide, which might end human civilization if they hit us. Researchers have now identified roughly 95 percent of the 980 behemoths thought to cruise through Earth's neighborhood, and none of them pose an impact risk for the foreseeable future. But the numbers get worse as the asteroids get smaller. Scientists have detected less than 30 percent of the 4,700 or so 330-footers (100 m) that come uncomfortably close at some point in their orbits. Such space rocks could destroy an area the size of a state if they slammed into Earth. And less than 1 percent of asteroids the size of 2012 DA14 or bigger have been identified, B612 officials say. These space rocks can cause severe damage on a local scale, as the 1908 "Tunguska event" shows. What's really needed to make a dent in these numbers is a dedicated asteroid-hunting space telescope that would scan the sky in infrared light from a Venus-like orbit, said B612 co-founder and chair emeritus Rusty Schweickart. Such a spacecraft could peer outward at Earth's neighborhood without having to contend with the sun's overwhelming glare, allowing many more space rocks to be detected. Over the years, a variety of different studies and advisory groups have recommended that NASA mount such a mission, Schweickart told SPACE.com. But the agency hasn't had the funding to get it done, so the B612 Foundation decided to take action. "We looked at the situation and said, 'Look, this is really the most important missing element, and it does not look as though — given the chemistry in Washington and the priorities that NASA has and the total circumstance — that this was going to get done anytime soon,'" said Schweickart, who is a former Apollo astronaut. "So we looked at that and said, 'Why don't we take that on?'" The result is B612's infrared Sentinel space telescope, which the group plans to launch toward a Venus-like orbit in 2018. In about 5 1/2 years of operation, Sentinel should detect 500,000 near-Earth asteroids, including the rest of the mountain-size space rocks and more than 50 percent of the 130-footers, B612 officials have said. The goal is to find big, dangerous asteroids several decades before they may hit us, giving humanity enough lead time to mount a deflection mission. Private funds will pay for the Sentinel mission, which will likely end up costing around $450 million. Sentinel won't be the only civilian space telescope scanning for incoming space rocks, if an asteroid-mining firm's plans work out. Planetary Resources, which counts Google execs Larry Page and Eric Schmidt among its financial backers, says its fleet of prototype asteroid-prospecting spacecraft should aid in the search as well. The company aims to launch the first of these telescopes, known as Arkyd-100s, in 2014 or 2015. The technology Planetary Resources develops to characterize and mine space rocks will also help protect Earth "by giving us the infrastructure to routinely and swiftly interact with and move asteroids, like 2012 DA14, which could someday pose a threat to Earth," company co-founder and co-chair Peter Diamandis said in a statement. Planetary Resources' asteroid-mining rival, Deep Space Industries, is planning to launch its own prospecting craft, known as Fireflies, beginning in 2015. Fireflies could examine potentially dangerous asteroids up close, gleaning insights about their composition that may be vital to deflection efforts, company officials say. "Placing 10 of our small Firefly spacecraft into position to intercept close encounters would take four years and less than $100 million," Deep Space CEO David Gump said in a statement. "This will help the world develop the understanding needed to block later threats."